A new ScienceCast video details an intense solar storm that narrowly missed Earth two years ago. If it had hit, researchers say, we could still be picking up the pieces. Last month (April 8-11), scientists, government officials, emergency planners and others converged on Boulder, Colorado, for NOAA’s Space Weather Workshop—an annual gathering to discuss the perils and probabilities of solar storms. The current solar cycle is weaker than usual, so you might expect a correspondingly low-key meeting. On the contrary, the halls and meeting rooms were abuzz with excitement about an intense solar storm that narrowly missed Earth. “If it had hit, we would still be picking up the pieces,” says Daniel Baker of the University of Colorado, who presented a talk entitled The Major Solar Eruptive Event in July 2012: Defining Extreme Space Weather Scenarios. 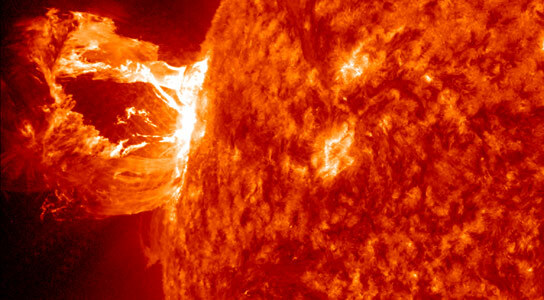 A new ScienceCast video recounts the near-miss of a solar superstorm in July 2012. The close shave happened almost two years ago. On July 23, 2012, a plasma cloud or “CME” rocketed away from the sun as fast as 3000 km/s, more than four times faster than a typical eruption. The storm tore through Earth orbit, but fortunately Earth wasn’t there. Instead it hit the STEREO-A spacecraft. Researchers have been analyzing the data ever since, and they have concluded that the storm was one of the strongest in recorded history. “It might have been stronger than the Carrington Event itself,” says Baker. The Carrington Event of Sept. 1859 was a series of powerful CMEs that hit Earth head-on, sparking Northern Lights as far south as Tahiti. Intense geomagnetic storms caused global telegraph lines to spark, setting fire to some telegraph offices and disabling the ‘Victorian Internet.” A similar storm today could have a catastrophic effect on modern power grids and telecommunication networks. According to a study by the National Academy of Sciences, the total economic impact could exceed $2 trillion or 20 times greater than the costs of a Hurricane Katrina. Multi-ton transformers fried by such a storm could take years to repair and impact national security. A recent paper in Nature Communications authored by UC Berkeley space physicist Janet G. Luhmann and former postdoc Ying D. Liu describes what gave the July 2012 storm Carrington-like potency. For one thing, the CME was actually two CMEs separated by only 10 to 15 minutes. This double storm cloud traveled through a region of space that had been cleared out by another CME only four days earlier. As a result, the CMEs were not decelerated as much as usual by their transit through the interplanetary medium. Had the eruption occurred just one week earlier, the blast site would have been facing Earth, rather than off to the side, so it was a relatively narrow escape. When the Carrington Event enveloped Earth in the 19th century, technologies of the day were hardly sensitive to electromagnetic disturbances. Modern society, on the other hand, is deeply dependent on sun-sensitive technologies such as GPS, satellite communications and the internet. “The effect of such a storm on our modern technologies would be tremendous,” says Luhmann. It also highlights the potency of the sun even during so-called “quiet times.” Many observers have noted that the current solar cycle is weak, perhaps the weakest in 100 years. Clearly, even a weak solar cycle can produce a very strong storm. 1 Comment on "New ScienceCast Video Details a Carrington-Class CME that Narrowly Missed Earth"
Perhaps we have to be more alert during quiet sun periods. The sun may have a constant output of energy but it is released either as a series of small, defusing eruptions or is blocked by some unknown mechanism until there is a massive outburst.